Braces are more socially accepted than ever. Different kids react differently to the idea of getting braces. Some can’t wait to get started with their kid’s braces, while others are worried about how they will look and feel. There’s really no reason to worry, though. Braces are just tools used by orthodontists to correct the alignment of your child’s teeth, a tried-and-true method that will help your child avoid many long-term dental problems. If your child needs braces, it’s not anyone’s fault. Some teeth just don’t erupt straight. Orthodontics “helps nature” take its course through teeth straightening. 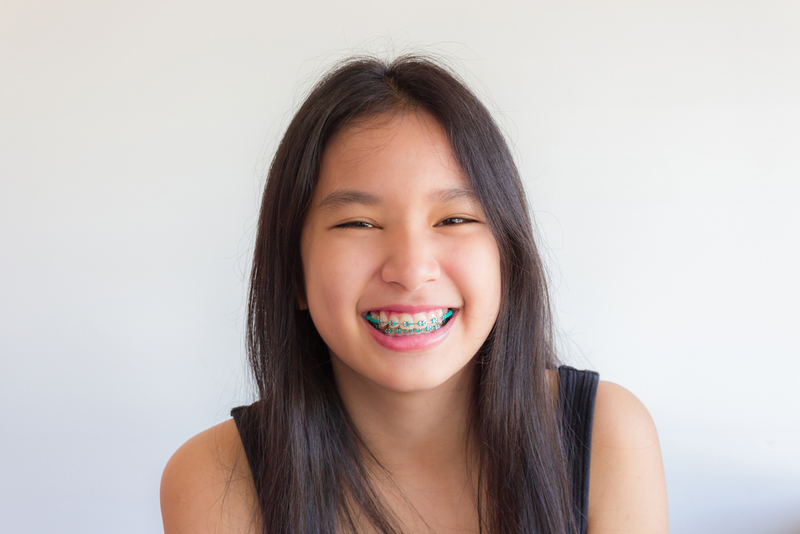 Many parents ask us “What is the best age to get braces?”The truth is that this can vary by patient. Generally, we counsel that if your child is 8 years old and you see signs that he/she might need braces, you should bring him or her in for a consultation. At that point, we can determine when would be the right time to start orthodontic treatment. Malocclusion. This is just a fancy word for when there’s a difference between the sizes of the top and bottom jaws. If the upper jaw is bigger, that’s called an overjet, while a larger lower jaw is an underbite. Over time, an incorrect bite can cause wear and breakdown of tooth enamel and the tissues that support the teeth. Oftentimes a misaligned bite isn’t noticed until later, after the jaw has grown and the teeth have shifted. When wisdom teeth start pushing on your other teeth, this can also cause crowding. Jaw pain and/or grinding. Using bottles and pacifiers beyond the teething stage can alter your child’s teeth growth. If not identified early, these habits can actually shape and move teeth, causing misalignments. If your child complains about pain in his/her jaw or you hear grinding at night on a regular basis, this would be a good reason to get an orthodontic check-up. Crooked or overcrowded teeth. Crowded and crooked teeth are difficult to keep clean, which may result in tooth decay and gum disease. Crooked teeth also often have a social cost as well. A survey by Adweek showed that about half of Americans think that a person’s smile is their single most memorable feature when they meet, and people with crooked teeth are frequently perceived as being less confident. Our patients often have many questions when they come in, about the average cost of kids braces, how much do braces cost with insurance, how much do Invisalign braces cost, etc. These questions are best answered after your child is examined by the orthodontist so we can get a better sense of what type of treatment is needed. We want you to know, though, that we are willing to work with you to make orthodontic treatment possible for your child. If you notice any of these signs by the time your child is 8, we encourage you to come in for a free evaluation. You’ll never regret getting a professional opinion to help you make decisions about your child’s future. Get in touch with our friendly office staff today to make an appointment for a free kids braces evaluation! You can reach us at 215.968.5471!